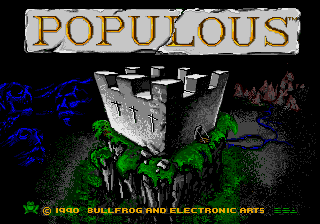 Populous (ポピュラス) is a 1989 computer simulation game by Bullfrog originally released for the Commodore Amiga and Atari ST .It was ported to the Sega Mega Drive internationally and Sega Master System in Europe. The American Mega Drive version does not have any TMSS support at all. The Mega Drive Populous is said to have been the first game Electronic Arts released for the system (or indeed any Sega console). In Populous, players play as a deity who controls land to affect peoples's lives in the hopes of crushing followers of another deity. The game is played from an isometric perspective, although unlike later attempts at simulations (such as Sim City 2000), there is no scrolling. Populous' sequel, Two Tribes: Populous II (a renamed version of Populous II: Trials of the Olympian Gods) was also released for the Mega Drive, as well as the more combat-orientated Power Monger. NEC Retro has more information related to Populous.